The 1901 census records 4 year old Herbert and 6 year old Fred living with their grandparents Edward and Mary Wardle at Blue House, Lands. Others living there were their uncles 33 year old George, 24 year old William, 21 year old John Alfred and aunt 26 year old Elizabeth. Edward, George, William and John were all coal miners. By 1911, Edward had died and his widow 64 year old Mary was head of the “extended family” living at Lands Bank. Others living with her were 35 year old son William who was an “out of work” coal miner at the time and 2 grandsons, 16 year old Fred and 15 year old Herbert. They were described as “colliery lads”. Herbert’s cousin Ralph Wardle from Evenwood Gate also died while on active service. 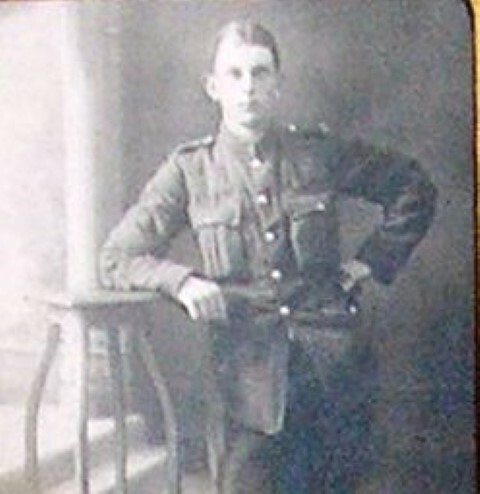 14526 Bugler Ralph Wardle, 14th Battalion, the Durham Light Infantry died of wounds 24 April 1917. He is buried at Bethune Town Cemetery, France and commemorated on the Evenwood War Memorial and the Roll of Honour, St. Paul’s Church, Evenwood. Herbert Wardle attested 12 August 1915 at Darlington when 19 years 4 months old. He worked as a miner and was 5’ 4¾” tall and weighed 110 lbs. He joined the Royal Engineers being given the regimental number 131539. Pioneer H. Wardle landed in France 8 March 1916. His trade was a carpenter  and he appears to have been “remustered” with the rank of Sapper (Carpenter Proficient) 16 September 1916. The Royal Engineers carried out a number of different roles for the Army both in the field and along the lines of communication. The various tasks were organised into different types of units which were attached to Divisions or to larger formations at Corps, Army or even GHQ. The main ones were the Field Companies and the Signals Companies and these companies often saw action and took part in the fighting. In August 1914, the Royal Engineers comprised 1,056 officers and 10,394 other ranks (Regulars and Special Reserve) along with 513 officers and 13,127 Other Ranks from the Territorial Force – a total of 25,090 men. By November 1918, some 314,318 men served with the Royal Engineers. The 1914 – 1918 Royal Engineer roll records the names of 19,794 men who were either killed or died on service. The Field Companies provided engineering assistance in terms of construction of roads, defences, bridges, the provision of water supplies as well as the demolition of obstacles and bridges. The Special (gas) or Tunnelling companies after their formation in 1915 were also deployed in the Divisional areas as circumstances required. Inland Water Transport, Postal, Railway, Searchlights and Survey are other RE specialised units. Mounted – included the CQMS, the Farrier, the Shoeing Smith, the Trumpeter, 3 NCO’s, the drivers and batmen. Dismounted – included many kinds of trades required by the Army in the field including 15 blacksmiths, 20 bricklayers, 40 carpenters, 5 clerks, 12 masons, 6 painters, 8 plumbers plus surveyors, draughtsmen, wheelwrights, engine drivers and so on. As with all other units, the Field Companies relied heavily on horses for transport and had an establishment of 17 riding horses for the officers and NCO’s of the Mounted Branch, 50 draught horses and 4 pack horses. There were also 5 spare draught horses as replacements. With the exception of the Trumpeter and Bugler all Other Ranks were armed as infantrymen carrying the SMLE rifle. Herbert Wardle joined up 12 August 1915 and entered France 8 March 1916. 30 June 1916: 39th Division took part in an attack around Richebourg l’Avoue (not officially regarded as a battle or engagement) and the Sussex Battalion suffered very heavy casualties. 1 – 11 October: the Battle of Ancre Heights (the ninth phase of the Battle of the Somme) and the Division captured the Schwaben Redoubt and helped capture Regina Trench. The Battle of Ancre Heights was a preliminary engagement to Haig’s autumn offensive involving the proposed capture of the Thiepval Ridge which looked over the upper Ancre area. Central in the defensive positions were the Schwaben Redoubt, Stuff Redoubt and Regina Trench. 14 October 1916: Schwaben Redoubt was cleared of the enemy on the afternoon. Appalling weather delayed further operations. 21 October 1916: Regina Trench and the adjoining Stuff Trench were captured thereby giving the British forces control of the ridge. 19 November 1916: with winter rain again enshrouding the battlefield, offensive operations were called off. After four and a half months of fighting on the Somme, British and Commonwealth forces were calculated to have lost 419,654 dead, wounded and missing; French losses amounted to 204,253. German casualties were estimated to have been between 437,000 to 680,000. January 1917 and the British were still recovering from the Battle of the Somme. In March, the Germans made a tactical withdrawal to the Hindenburg Line to better consolidate their defences. On the 6th April, the French began their Nivelle offensive on the Aisne which ended in failure and in its wake mutinies broke out amongst French units in May 1917. On the 9th April, British and Canadian forces launched what was to become known as the Battle of Arras during which they captured Vimy Ridge then political pressure necessitated another offensive. At the end of July the Third Battle of Ypres commenced, what is now known as Passchendaele. The Germans had spent the previous year strengthening their defences by installing concrete pillboxes for their machine gun emplacements on the higher ground in Flanders. It was obvious to the Germans from their vantage points that an offensive was imminent and the attack at Messines Ridge on the 7th June 1917 was a further indication of the Allied intent. However delays occurred and it was not until the 11th July that the air offensive began followed on the 18th July by a massive artillery bombardment then on the 31st July the attack itself commenced. Nine Divisions of the British Fifth Army attacked north east from the Ypres Salient. Initially good progress was made but after strong counter attacks the advance, no more than 2 miles, stalled. Heavy rain fell on the first night flooding the swampy ground whose drainage system had been totally destroyed by the 10 day bombardment. As a result the whole operation was held up and the next significant attack did not take place until the 16th August – the Battle of Langemarck. Field engineers were engaged in improving the lines of communication, duck boarding tracks, bridging streams, constructing mule tracks, building advanced field dressing stations, building divisional unit battle headquarters and building cover for field guns, screening roads in exposed places, clearing blocked streams, removing obstacles from paths of tanks, destroying bogged down tanks, hauling guns from the mire and laying tape to guide infantry units forward. The Third Battle of Ypres cost the British nearly 310,000 casualties, the Germans slightly less and had consumed all of the available reserves and it achieved none of its strategic objectives. Perhaps these men were killed in the same incident. Sapper H. Wardle was awarded the Military Medal, the British War and Victory medals. Sapper H. Wardle is buried at grave reference XIV F 7 New Irish Farm Cemetery. The cemetery is located to the north east of Ieper, Belgium near a small country village of Zwaanhofweg. It was initially used from August to November 1917 then again in April and May 1918. “To the relatives of Private Herbert Wardle M.M. We the inhabitants of Lands wish to place on record our great appreciation of the gallant services rendered to his country in the Great War by Private Herbert Wardle. No. 131539, 234 Company Royal Engineers. 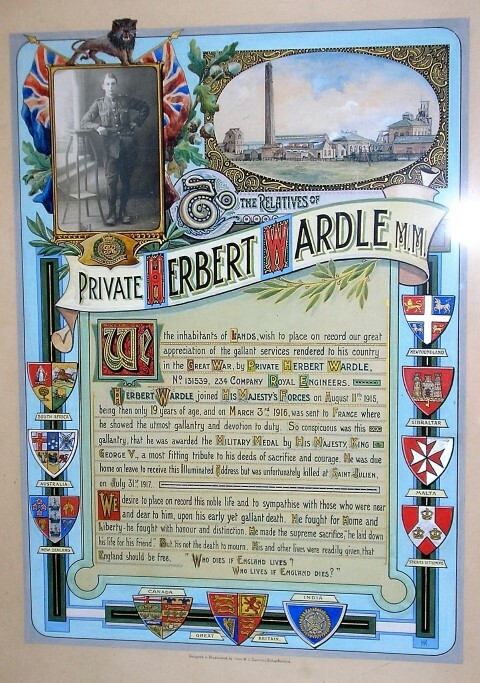 Herbert Wardle joined His Majesty’s Forces on August 11th 1915, being then only 19 years of age and on March 3rd 1916, was sent to France where he showed the utmost gallantry and devotion to duty. So conspicuous was this gallantry that he was awarded the Military Medal by His Majesty, King George V, a most fitting tribute to his deeds of sacrifice and courage. He was due home to receive his illuminated address but was unfortunately killed at St. Julien on July 31st 1917. We desire to place on record this noble life and to sympathise with those who were near and dear to him upon his early yet gallant death. He fought for home and liberty – he fought with honour and distinction. He made the supreme sacrifice; “he laid down his life for his friend.” But, ’tis not the death to mourn. His and other lives were readily given that England should be free. “Who dies if England lives?